Self-directed health: Health managed by yourself, for yourself, with results that exceed those obtained through conventional healthcare. We call it obtaining health Undoctored. Hi, I’m Dr. William Davis, founder of the Undoctored program for health and author of several books, including Undoctored: Why Health Care Has Failed You and How You Can Become Smarter Than Your Doctor and the Wheat Belly series of books. Sure, you could remove a wart using the cider vinegar recipe your grandmother gave you--big deal. But I’m referring to something much more substantial. And I don’t mean removing your own appendix or self-splinting a leg fracture in your garage. I call this phenomenon Undoctored health, or self-directed health: health practices and disease treatment that are self-managed. You might already recognize a rudimentary form of Undoctored health in its predecessor, “wellness,” the healthy-eating, take-an-exercise-break, check-your-blood-pressure and know-your-cholesterol practices followed at workplaces to reduce healthcare costs. But the concept is evolving rapidly from this humble start. And it’s going to grow much bigger. Direct-to-consumer laboratory testing, a silent but substantial phenomenon, has emerged only in the last decade, largely in response to physician reluctance to order tests requested by individuals eager to explore health. Cost awareness to the price of lab testing is also growing as more people are exposed to health costs through larger insurance deductibles. Competitive pricing that develops naturally in a direct-to-consumer retail service yields substantial cost savings. (50% or more is not uncommon.) A mind-boggling array of self-directed tests is now available, from advanced markers for heart disease, to genetic cancer markers, to hormonal assessments that promise to further enrich the Undoctored, self-directed experience. Undoctored, self-directed health is a phenomenon that will stretch far and wide into human health. It will encompass preventive practices, diagnostic testing, and therapeutic strategies. Self-directed health will grow to include heart disease, cancer prevention and identification, diabetes and pre-diabetes identification and management; osteoporosis identification and correction; genetic testing; issues of interest to men, issues of interest to women. Undoctored health will dramatically shift the landscape of healthcare, change the economics of payment for healthcare, and revolutionize health for millions. Critics will say this is hazardous. In our drive-thru, just-add-water-and-microwave world of instant gratification, critics will warn that there is potential for danger. They fear that people will misdiagnose, misinterpret, or fail to recognize various conditions, choose the wrong diagnostic test, institute the wrong treatment. Chaos will result, unnecessary or unwise treatments instituted. There is a common and pervasive misconception that the public is incapable--too lazy, too stupid, too poorly-informed--to manage their own health. This notion, a curiously modern perception, cultivated by regulation, has proven self-fulfilling. The doctor makes a diagnosis, prescribes treatment (with little or no explanation), and the patient is expected to comply. If the patient searches the internet and comes armed with a stack of reprints to ask the doctor some questions, more often than not the information is dismissed. “Why don’t you just ask the internet to treat you, too?” Indeed. Over the past eight years, I have participated in a website experiment that provides online guidance on how to identify and manage coronary artery disease, the disease leading to heart attacks, bypass surgery, and other major hospital procedures. The followers of the program are not people in the midst of a heart catastrophe like heart attack, but everyday people who have had coronary atherosclerotic plaque identified with a self-ordered test called a CT heart scan. The “score” obtained through a heart scan serves as the basis for a program that tracks the score, identifies its causes, corrects the causes. People following the program enjoy a level of insight into heart disease that has astounded cardiologists and primary care physicians. Participants have stopped or reversed their scores--reversed coronary disease--using little or no medication. I have published these data in the medical literature. Information is the basic ingredient required to even begin to talk about Undoctored, self-directed health. Reliable information is an absolute necessity, information that seeks only to inform--without profit, without the bias of marketing. 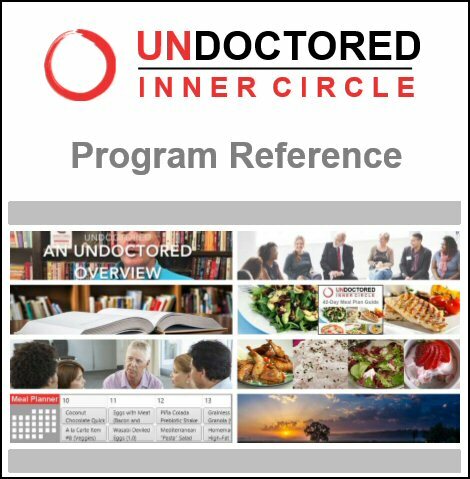 Undoctored is not just about weight loss or gaining more energy. It will spark public consciousness and help create a movement of self-directed health that will change healthcare. Right now, in our lifetimes, it is entirely possible that half the healthcare we receive--or fail to receive - through conventional paths will fall under the umbrella of self-direction. I challenge each and every person to become their own best health advocate and enjoy perfect health: perfect weight, feel great and energized every day, enjoy an optimistic outlook, free from pain and disability, all Undoctored.